One of the main features of the SLUGS AP is its ability to interact with virtually any Simulink model. There is a predefined protocol to send simulated sensor readings to the AP, as well as a protocol to receive control commands back. But aside from that, one can make the HIL simulator as simple or as complex as one needs. Currently we have a six-degree-of-freedom model of our UAV, and an engine model. Some work is underway to include an atmospheric and weather model. The Simulation PC. This PC can be the same as the Ground Station, but it is not required. Data is sent and received via a UDP port from the Ground Station software. The Simulink Model has a predefined block to send simulated sensor readings to the SLUGS AP. In the same way, it has a predefined block to receive control surface commands. The Ground Station PC. 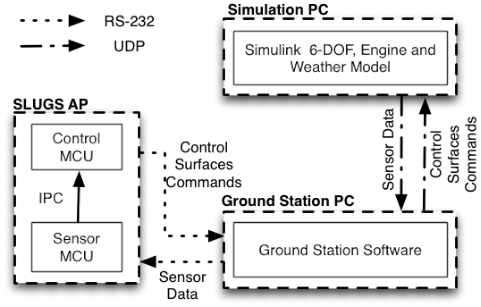 When the HIL is enabled in the SLUGS AP, the Ground Station software acts effectively as a middleware. It receives simulated sensor readings from Simulink via UDP and sends them to the Sensor MCU via RS232. In the same way, it receives from the Control MCU, via RS232, control surface commands which in turn it sends back to Simulink via UDP. 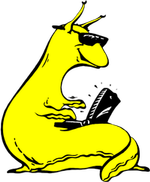 The SLUGS AP. The AP can be set to HIL mode via the Ground Station software. When this is the case, the AP stops reading data from the onboard sensors and treats incoming RS232 data as true sensor readings. This HIL architecture makes easy to develop and expand the actual simulation model by harnessing all the power of Simulink. At the same time it allows one to run and test all the control algorithms without the need of a test flight. This is specially useful in the first phases of new algorithm development.